How will RoboCars work, and when will we have RoboCar's? The RoboCar vision offers huge gains in accident rates, erasing traffic congestion and more, but is it pie in the sky or will we actually have self-driving robotic cars roaming our cities in the future? 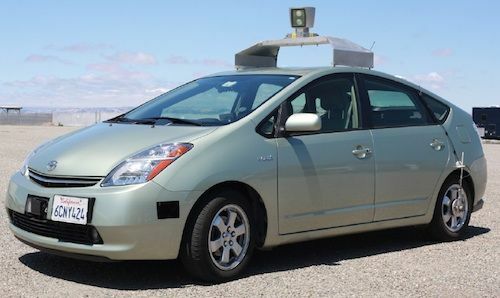 Today Google's Self-Driving car project does have modified Toyota Prius's roaming the streets, primarily in Silicon Valley, prototyping the RoboCar's of the future. We're collectively past 2001 and we don't have flying cars, nor video-phones (well, except for FaceTime or Skype), nor AI driven space ships orbiting Saturn, nor most of the other predictions of Science Fiction. The future isn't exactly what we thought it would be, eh? The RoboCar vision described by Brad Templeton and others is a plausible vision of the future, if for no other reason than the multiple efforts underway at universities and corporations around the world working to develop parts of the RoboCar vision. It seems like it's just a matter of time and continued technology development for the ideas to become real. In Templeton's vision, RoboCars will have on-board camera, RADAR and GPS systems to have a virtual map of the terrain & traffic around the car. Using these data inputs the RoboCars will be able to detect other vehicles, pedestrians, bicyclists, road blockages and more, and be able to drive in any existing traffic condition. He can speak confidently about this because the Google Self-Driving Car project has already logged well over 160,000 miles of driving an automated car (under human supervision) on regular city streets. When fully developed Templeton envisions human occupants of RoboCars kicking back to relax or talk with family members, while the car drives them around the city. Additionally, RoboCars could drive themselves around town even with no human occupants, and such uninhabited cars could be part of a car sharing program, or act as an automated delivery vehicle for stuff bought online from a store. Google's Self-Driving Car project are modifying Toyota Prius's, and other cars with drive-by-wire systems, to make it easier to interface with the on-board control systems. The drive-by-wire system makes it easier to insert computerized control of driving parameters. The vision requires no changes to the existing infrastructure and represents a bottom-up approach to rehabilitating the transportation system, rather than a top-down approach. Some visions such as the Personal Rapid Transit (PRT) concept requires building a whole new transportation infrastructure of elevated tracks and cars. That new infrastructure requirement, and its cost, has always blocked PRT development. The RoboCar vision uses vehicles similar to the ones driving on roads today, but with computerized control system for automated driving. More importantly, RoboCars require no change to the existing roads. The concept relies on GPS and other systems to help the car know its precise location, and constantly updated map data so the car's onboard sensors can scan the road and detect differences between what's expected and what it sees. For example a pedestrian walking across the road, or other cars on the road, would be different from the objects (street signs, street lights, buildings, etc) in the map data, the on-board computers would detect this difference and have programming to act correctly. RoboCars could make a very interesting car sharing system. Consider using a smart-phone app to contact a RoboCar service that has a fleet of cars circling around the city. You tell the service how many people are in your group, where you're going, and the sort of functionality required. The RoboCar service would have in its fleet a variety of vehicles, and would automatically dispatch a driverless RoboCar that would drive itself to your location. If the service works well, your car could arrive within a few minutes on typical requests, or a bit longer for unusual requests. Shared RoboCars could drastically reduce parking lot size. Today when you drive somewhere, its in your own car, which you park at your destination, consuming a parking spot. In some places that parking spot is free, in other places the parking spot costs money, and in any case that parking space is land that's prevented from being used for more productive uses. The shared RoboCar offers a different model that doesn't require dedicating a parking space for each car arriving at a given place. Instead, once the RoboCar drops you off, it goes back into the system and is available for the next person who needs a car. No parking space required, and once you're ready to leave you simply call up a new RoboCar. Today's zoning regulations require businesses or shopping centers to build extensive parking lots that wouldn't be required if we were instead using a shared RoboCar system. Some cities today have car sharing programs like ZipCar, CityCarShare or car2go. Car sharing can be cheaper than outright owning a car, but because current systems don't have RoboCars, they are only practical in high population density cities. Those of us living in the suburbs generally don't have car sharing programs. Because the RoboCar drives itself to where you are, it's both simpler to use than existing car sharing, and it becomes practical in lower population density areas (suburbia) where existing shared car systems are completely impractical. Driving today's cars creates a tension between the driver and passengers, especially when the passengers are fidgety children. The passengers can distract the driver, leading to inattention, and inattention is the leading cause of traffic accidents. The driver wants to pay attention to the road, but the fidgety children want attention. The RoboCar, by taking care of the driving, would let the passengers do anything they want to with each other with no risk. Yes, anything. When will we have these cars for real? Templeton says it'll be 20 years or more before they're practical, and the component costs are low enough to be affordable. In the meantime there are some legal hurdles to cross, the first example of which was law passed recently in Nevada that allows for driverless cars. The vehicle codes around the country were written with an assumption there would always be a human driver on-board, and that the driver would have a valid drivers license, and so forth. If the RoboCar takes care of the driving, do the human passengers need to have a drivers license? Could this be a way to send children to and from school while not requiring their parents to do it? Could this give a whole new level of mobility to the disabled? DUI violations would be a thing of the past, with RoboCars taking over the driving. Similarly, snoozing while driving would no longer mean death in a fiery accident. if human occupants of a RoboCar aren't required to have a drivers license, wouldn't the RoboCars have to be licensed? Just like automakers today have to pass safety testing and other requirements, future automakers who manufacture RoboCars would be required to satisfy some to-be-designed set of regulations ensuring much more than the crashworthiness measured by NHTSA today. In any case it's obvious that RoboCar adoption will require a massive overhaul of the vehicle code. We do have flying cars! I'll have to look it up for you but five guys from MIT are building them even now. The company's called Terrafugia and last July they were trying to get through the last of the NHTSA and FAA hoops. They're approved for sale, actually. Can't link here, but I wrote something about it back in October.